Augsburg was founded in 15 BC under the rule of the Roman emperor Augustus. For 400 years the city was the seat of a provincial government of the Roman empire. Its ideal location made it a crossroad of all important routes to the south. An advantage from which the powerful merchants and bankers, the Fugger family and the seafaring Welsers, likewise profited. 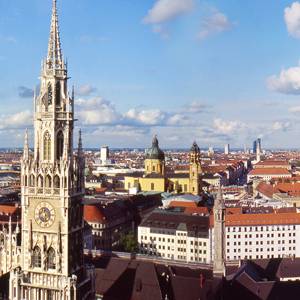 They elevated Augsburg to rank among the world’s most powerful cities. Kings and emperors were frequent guests here. In the 13th century Augsburg became a Free Imperial City. It grew to be a creative center of famous painters, sculptors, musicians and architects. Here the ancestors of the composer Mozart and the painter Holbein dwelt for centuries. Numerous churches and the Dom (Cathedral) mark Augsburg as the seat of a bishopric. It was here that, in 1518, Martin Luther and Cardinal Cajetan engaged in their famous debate. Down through 20 centuries, there developed a cityscape shaped by all the great stylistic epochs. The Renaissance in particular flourished here – and Rococo became known as “the Augsburg style”. It is the fertile interplay of religious and secular power that gave Augsburg – Bavaria’s third-largest commercial center – its inimitable flair.Great buildings, monumental fountains, lavishly laid-out streets and ultramodern architecture attest to the city’s cosmopolitan liberality. Concerts in splendid halls, opera and operetta in open air theaters, art exhibitions, magnificent churches, the Fuggerei and the Schaezlerpalais in Rococo style draw tourists from all the world. Because Augsburg is a city with 2000 years of living history. The Romantic Road leds to charming villages, towns and cities between the Main River and the Alps. Stop in Rothenburg on the River Tauber to explore Europe’s most perfect medieval gem, and experience a community where time seems to stand still. The imposing town hall, massive fortifications, churches and patrician houses are witnesses to a mighty imperial past.